SACRAMENTO, Calif. — It’s been 28 years since there’s been a Jeep-branded pickup, the Comanche, sold from 1986 through 1992. 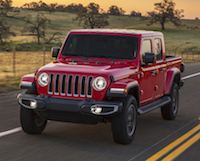 As one of the most highly anticipated new vehicles to launch in years the Gladiator finally arrives amid renewed interest in midsize pickups among the likes of Chevrolet Colorado, Toyota Tacoma, and Ford Ranger entries. Before the all-new 2018 Wrangler models arrived, you had to be a Jeep aficionado to really enjoy living with it on a daily basis. They were built for off-road, no apologizes necessary. Thankfully, the new Jeep has been updated with refreshed styling, a higher-quality interior, and new safety features. The carryover Pentastar 3.6-liter V-6 that produces 285-horses and 260-lb-ft of torque can now be mated to a modern eight-speed automatic transmission, which improves drivability. We lived with the standard six-speed manual, which will probably be the choice for most people opting for the off-road capable Rubicon. MALIBU, Calif. — With 9 million sales worldwide and 2 million in the U.S. alone, the compact crossover utility vehicle is “the largest SUV segment in the world,” says Scott Tallon, director of Jeep Brand. Up against segment leader Nissan Rogue and big sellers like Honda CRV, RAV4 and Ford Escape, the Jeep Cherokee makes up just 9.5 to 10 percent market share in the segment. The Jeep Grand Cherokee Trackhawk may be the most politically incorrect vehicle on the planet. It's the antithesis of the electric mobility craze that's sweeping the world's automobile manufacturers. The only range anxiety with this beast comes from the many stops it takes to keep the tank loaded with high octane gas. TUCSON, Ariz. — One could easily argue that the Jeep Wrangler is the most instantly recognized vehicle in the world. Even my three-year old grandson would excitedly call out “Jeep, Papa! look!” whenever he saw one. Born in 1941 as the Willy’s Overland MB, it was specifically tailored to Army specifications for the Allied soldiers in World War II. Most were sent to soldiers in England and Russia under the Lend-Lease program. Manufactured here stateside (that's a BIG deal now, more than ever) the 2017 Jeep Wrangler Unlimited four door “go anywhere” vehicle is produced in Toledo, Ohio. It has an unmatched off-road aptitude, regardless of the various terrain you might be negotiating. SAN ANTONIO, Texas — Jeep, a brand that builds nothing but more than capable SUVs, is absolutely booming. Overall sales are up for the seventh year in a row, including three straight years of one million vehicles sold, with a record breaking 1.4 million in 2016. It doesn’t hurt that American car buyers have made a dramatic shift from traditional family sedans to utility vehicles; the hottest segments are compact and subcompact crossovers. The Cherokee has become the best-selling nameplate in the Jeep stable of sport utilities and crossovers accounting for more than 200,000 units sold each year since its introduction in 2014. So it is no surprise that Jeep has created a high-end model with virtually every available option for those customers who don't want to give up their very capable and stylish ride, but who yearn for a touch of luxury and the latest in technology, safety and infotainment features. Positioned as a two door sport utility and classified as a multipurpose vehicle by the EPA, the four passenger, 2016 Jeep Wrangler is clearly an authentic ”go anywhere” SUV. Its built on 75 years of legendary and notable heritage. With class-leading capability, craftsmanship and underlining versatility, Wrangler is aimed at people who seek extraordinary journeys and active lifestyles. Most of the time auto reviewers are loaned top-of-the-line vehicles or at least heavily-contented versions affording them the opportunity to experience all the goodies the manufacturer has to offer. So it was a mild shock to take delivery of a base Jeep Renegade Sport with front wheel drive and a six-speed manual transmission.